Do you long for a deep connection with yourself, nature, the divine feminine, and a break from your everyday life? If so, this epic journey is for you! This is a journey of a lifetime, one that invites you into deep positive change and opens you to a reverence for all that is. Come with Ashram of Arts to discover a place with the power to heal and open energy pathways like no other place can, as you explore yogic practices in the setting of their origin - in Mother Nature. During this backpacking yoga retreat, you will be staying in a tent on Mother Earth throughout your stay in the mountains for three nights. Please let Ashram of Arts know if you are fine with sharing a tent or otherwise. Solo tent option is also possible. You meet up at a designated spot and caravan to the trailhead. Beforehand, by email, you'll receive a "Backpacking Gear Check List", "Wilderness Safety Guidelines" and "Leave-No-Trace Backpacking" information. Also, before the pilgrimage, Mountain Shakti will connect with each person by Skype or phone to go over your gear and to field any questions. Celebrate the full moon on a high mountain ridge. A time to rejoice, coming together in sisterhood. On your first full day in the mountains, you will enjoy breakfast and practice Devi Yoga flow. Afterwards, you will trek through meadows of blueberries and forest, ascending and opening up to expansive and awe-inspiring views of Mt. Baker, where you will explore and practice the teachings of Goddess Parvati and what she has taught about the embodied yogini. After morning Devi Yoga flow and a chai masala tea breakfast before panoramic views of Mt. Baker, you will head out for a day hike up to an old 1930's fire outlook. You will pass a chain of tarn lakes welcoming you to goddess Tara's shores, where you will meditate, lunch, swim, write, and sunbathe before you hike up to the outlook with stunning views of the mother mountain as you go and then returning back to camp. You will practice Devi Yoga flow with the rising sun before a skyline of endless mountain peaks. After breakfast, you will hike back, nourished by abundant beauty of high ridge views and open expanse meadows, along with drinking from the many streams of snowfield water along the way. Experiencing first hand what it means to be nourished by the natural elements, beginning your journey back towards home, refreshed and renewed. Stephanie Renee dos Santos passion is empowering people to fully embody your best-self through nondual Tantric wisdom and aligning with natural cycles. She is known as an inspiring, loving, creative, and compassionate teacher with the Hindu goddess Bhuvaneshwari-like quality to create sacred healing, creative-expressive, and meditative spaces. 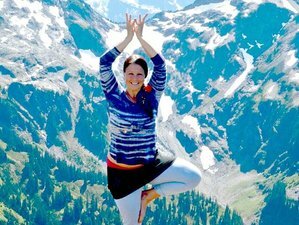 Certified in Integrative yoga and she is been given permission by loved teacher Sally Kempton to share the teachings of the nondual Shiva or Shakti tradition. She holds a B.A in Studio Arts from Whitman College and is a working artist. This sacred yoga pilgrimage will take you into the heart of the North Cascades Range of Washington State in the Pacific Northwest. You will be backpacking one of the most beautiful sections of the Pacific Crest Trail. Rosy-golden rays of summer sunlight warm your face as you bask in Goddess Lalita's late afternoon glow below a coin-like full moon. A sea of ancient forest spreads as far as the eye can see, the mystical realm of wise Yakshis, female tree spirits. Your whole being nourished by breath-enhancing beauty before you, glacial peaks extending out into space, the roof of the world, sharing nutrient rich stream water, the domain of Goddess Annapurna. She, Your Divine Mother, IS, this sacred geography. Ashram of Arts will provide vegetarian and gluten free backwoods fare. Daily breakfasts and dinners are included. Meals will be prepared by trip leader with the flexibility to prepare your own coffee or tea, snacks, and hot soups as you please. Lunches you will provide, so you can have exactly what you like to eat of this meal each day. Also to gain experience in how to buy and pack your food for future backpacking journeys you'd like to take on your own. Personal empowerment and developing self-sufficiency skills is an important aspect and gift of backpacking that directly relates and supports the Tantric Goddess studies you are exploring and practicing on this sacred journey. Please book your flight to arrive at Seattle-Tacoma International Airport (SEA). Transfer from and to this airport is available upon request. For carpools and transport to pilgrimage starting point, Ashram of Arts will help you arrange if you are coming from afar. On the first day of the trip, you will meet up at a designated spot and caravan to the trailhead together with the option to also meet Ashram of Arts at the trailhead. Airport: Seattle–Tacoma International Airport Airport transfer available: Seattle–Tacoma International Airport Additional charges may apply. You can request this in the next step. Mountain Shakti is passionate about empowering people to heal their body and soul so they can come into deep communion with the divine and thrive in life. The prices below include an early bird discount of 140 USD per person. To benefit, book or reserve before May 18, 2019.